The foundation of a house is generally either poured concrete or block concrete and surrounds the bottom of the house beneath the siding. While you can hide the foundation with landscaping, you also can paint a house’s foundation to make it blend in with the rest of the exterior of the house. Start the painting project by taking care to prepare the concrete foundation to ensure that the paint adheres properly to the concrete surface. Wash the concrete foundation with the pressure washer, setting the sprayer at between 2,000 and 2,500 psi and holding the sprayer about 12 to 18 inches away from the surface. Allow the concrete surface to dry completely. Spread tarps over the ground to protect it from paint. Patch any cracks with concrete caulk, filling the cracks completely. Allow the caulk to dry thoroughly before proceeding. Apply the concrete primer over the foundation using the paintbrush or the paint roller. Make the primer coat thick enough to cover the concrete completely. Allow the primer to dry. Paint the foundation with the exterior paint, applying it with either a paintbrush or a paint roller. Wait for the paint to dry completely, and apply a second coat to ensure thick and attractive coverage over the foundation. A thick coat of primer and paint should last up to 10 years. If your foundation surface is smooth, you need much less primer and paint to cover it. 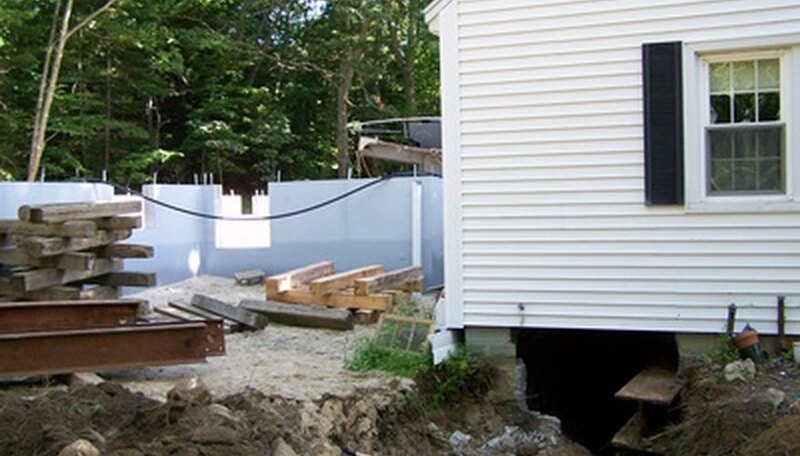 You might need up to twice as much primer and paint to cover a foundation with a rough surface.